As we curtail commodification, we might recall that it was on this date in 1976 that The Steves– Wozniak and Jobs– released their first product, the Apple I. Designed and hand-built by Wozniak, the computers were sold wholesale by Jobs (at $500 wholesale, for a retail price of $666.66, the equivalent of $2,800 today). In 2014, a working Apple-1 sold at auction for $905,000. Recently, OpenAI announced its latest breakthrough, GPT-2, a language model that can write essays to a prompt, answer questions, and summarize longer works… sufficiently successfully that OpenAI has said that it’s too dangerous to release the code (lest it result in “deepfake news” or other misleading mischief). We believe this project is the first step in the direction of developing large NLP systems without task-specific training data. That is, we are developing a machine language system in the generative style with no explicit rules for producing text. We hope for future collaborations between computer scientists, linguists, and machine learning researchers. A boring sentiment from an interesting source: the AI wrote that when asked to describe itself. We live in interesting times. Much more than mere domino tumbling, my kinetic gadgets use a wide variety of chain-reaction techniques of my own invention and they have Dalíesque names like Experimental Polymodal Slack-Generating Apparatus #9 and Test Detonation of 0.2 Kilostick Boosted-Yield Xyloexplosive Device #1. Not only can my gadgets collapse and explode in many ways, but they can play music tunes and have animation in them. The video above– 2250 colored tongue depressors woven together, then “detonated”– is Tim’s largest and most recent; see his others here. Many thanks to reader CE for the tip. As we marvel that all is in motion, we might remark that the Homebrew Computer Club held its first meeting in Gordon French’s garage in Menlo Park on this date in 1975. 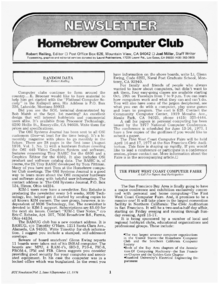 The HCC was a forum devoted to making computers more accessible to folks-at-large, and included members like Bob Marsh, George Morrow, Adam Osborne, Lee Felsenstein, Steve Jobs, Steve Wozniak. and John “Captain Crunch” Draper– many of whom went on to found (and/or profoundly to influence) personal computer companies. The first issue of its newsletter was published ten days later, and ran for 21 issues, through 1977. 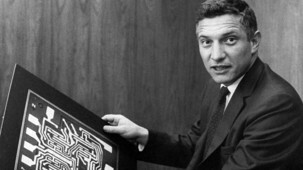 It was hugely influential in the developing culture of Silicon Valley (e.g., it debuted the concept of the “personal computer”)– and in establishing the battle lines in the industry then still nascent: it published Bill Gates’s Open Letter to Hobbyists, which excoriated enthusiasts of the time for “pirating” commercial software programs, and set the tone for what would become Microsoft’s IP posture. 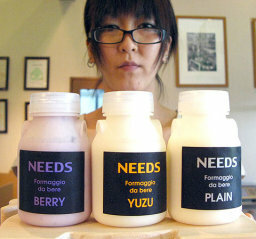 Japanese cheese company NEEDS has developed a new line of thirst quenchers, a cheese drink that comes in three flavors: plain, blueberry, and yuzu citrus. Samplers report that it has a taste similar to yogurt, but with a cheesy aftertaste. We want consumers to be more familiar with cheese, so we’ve made a liquid version that makes it more accessible. It’s also good as a salad dressing. Find other “alternative” soft drinks here… as for salad dressing, it’s NEEDS or you’re on your own. – Ken Olson, president, chairman and founder of Digital Equipment Corp., 1977.